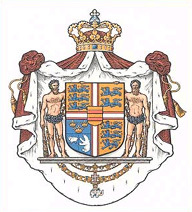 The Danish Royal Coat of Arms was established by Royal Decree of 5 July 1972. Compared with earlier versions the quarterings have been reduced because HM The Queen no longer holds official Ducal titles as her male predecessors had done. In addition to the arms of Denmark, the Faeroe Islands and Greenland, a few historic quarters were retained. The shield is divided into quarters by the cross of the Dannebrog. The first and fourth quarters show the arms of Denmark, three crowned lions surrounded by nine hearts. They date back to the end of 1100 and have been used ever since by the Kings of Denmark. In the second quarter there are the two lions of Southern Jutland. Being a cadency from the middle of the 13th century of the arms of Denmark, they were adopted as an integral part of the coat of arms of Danish kings when Christian I became Duke of Southern Jutland (Schleswig) in 1460. They are still borne as a special consideration for Southern Jutland, whose history differs greatly from that of the rest of the country. The third main quarter is divided into three smaller quarters. The three crowns are, in fact, the arms of Sweden, but here they represent the union of the three Nordic Kingdoms (the Kalmar Union), to which Danish kings have alluded in this way since 1546, and since 1613 under the authority of a peace treaty with Sweden. The ram is the arms of the Faeroe Islands and dates back to the 14th century. The sitting bear rampant became the arms of Greenland in the 1660es. At the centre of the Dannebrog cross lies a small escutcheon with the two bars of Oldenborg. They date back to the 1100s and indicate that the Royal House of Denmark is a branch of the Oldenborgs. The shield encircled by the collars of the Order of the Elephant, and the Order of the Dannebrog is supported by two savages, first used by Christian I. They stand in a pavilion surmounted by the Royal Crown. The Royal Coat of Arms may be shown without supporters and the pavilion. Thus the crowned Coat of Arms is encircled by the collars of the orders of chivalry on HM The Queen’s shield as Sovereign of the Orders in the chapel of Frederiksborg Castle, and in the Great Seal which is used for Royal Appointments and original Acts of Parliament.